…I think the music helps!! Sheep must be dry to be sheared! Sheep with wet wool – including dew and/or frost – should NOT be sheared. Sheep should be held off feed and water at least eight hours before shearing. The flock should never come straight off pasture to be sheared. Grass and hay may build-up gas and possibly back-up into the lung area during shearing and cause what is called ‘a gasper’. If the animal is not put on its’ feet right away, it could die of suffocation. If possible, stained wet wool and manure tags should be removed before sheep are penned. Avoid penning sheep in dirty pens or bare concrete floors. White-faced, white wooled sheep should be sheared first; dark-faced/colored wool sheep (light to dark) last. White wool and colored wool should not be packed in the same bag. Typically, for the small shepherd, bag each fleece individually, with a name tag for easy identification. To properly ‘skirt’ a fleece before packing, the wool should be placed cut side down on a slotted surface (to remove second cuts). Any vegetable matter (VM), manure or urine stained wool should be removed. Leg and face clippings should also be removed. The shearer should have already removed the belly wool when shearing. After skirted and cleaned, the fleece should be folded lengthwise, a third over a third, then the other third folded over the top and then rolled from the tail to the head before being packed. If possible, pack in burlap bags; plastic bags should be stored out of direct sunlight to avoid condensation. Plan to provide adequate adult helpers to keep the job moving. A clean, flat level surface (approx 8 X 8 feet) with lots of head room, good lighting and ventilation is best for the shearer to work on. A sheet of plywood or rubber mat makes a good working platform. If extension cords are necessary, heavy-duty cords to carry the load are recommended. Keep the shearing area swept clean when necessary. Keep a small pen filled and at the ready for catching sheep for the shearer. Sheep chased around a large pen/pasture before coming to the shearing floor will continue to fight while being sheared (and waste the shearer’s time). No shearer deliberately cuts a sheep! If you wish to put disinfectant on any nicks or cuts have your spray bottle handy before shearing starts. The shearer is not going to hold a sheep for ten minutes while you try to find your spray bottle. Have sufficient help to take the sheep from the shearer and do your foot trimming, vaccinations and worming after shearing (most shearers will assist the small shepherd, if requested). Brutus gets the royal treatment. 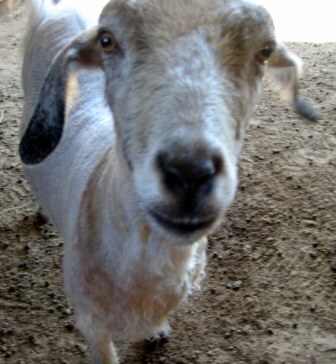 Brutus is my registered Pygora wether…a fiber goat…a cross between an Angora goat and a Pygmy goat. Normally, Brutus, who has Type B fleece (a combo of lustrous ‘locks’ and downy cashmere) is sheared twice a year (Fall and Spring). But, this summer-time weather has been anything but normal! 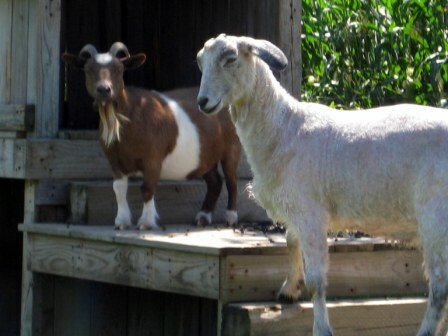 It’s been hot and humid for long stretches at a time, with not much relief during the night…and it’s hard on our pets including the barnyard menagerie! Brutus seemed so uncomfortable in his unusually tangled matted fleece, that we decided to give him the royal treatment…haircut, bath, pedicure, massage and lots of animal crackers! Even my killer electric shears wouldn’t tackle his matted fleece! YIKES! So, Katie and I used good old-fashioned hand-shears and we each worked on one side of Brutus! He was soooo patient and tolerant of our ‘primping’. Brutus is showing-off his new ‘do’ to our Pygmy, Oreo, who doesn’t seem impressed! Say ‘cheeeeese’ for the camera, Brutus! Hmmm…I forgot to brush his teeth?!!? So much better (even if it’s a bit ‘choppy’). Love you, boyfriend! 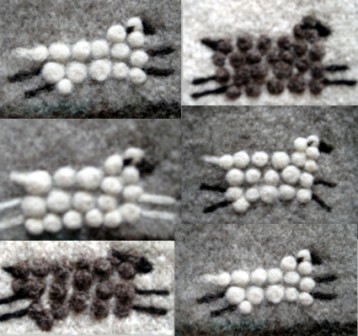 I’ve been preoccupied with sheep these past few days…working on a ‘custom’ needle felting job for a friend. 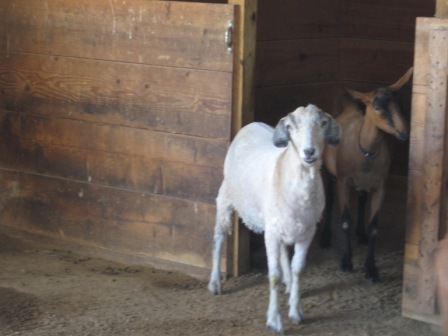 But, also here on the farm, we’ve sheared the sheep (plus one ‘fiber’ goat, Brutus, our Pygora). We actually delayed shearing this year to the END of March compared to last year due to the cold weather! Even so, still too cold! Brrrr…pleeeze send warmer weather! We had a busy Saturday at Metropark’s Wolcott Farm Annual Sheep Shearing event. While farm visitors observed the sheep being sheared in the barn, we were warm inside the farmhouse kitchen dyeing wool with Kool-Aid. We rekindled old friendships with talented fiber folk including a weaver, hand spinners and rug hookers… who were also demonstrating their fiber skills! All the while, hubby was home cutting another hole in the barn to create another inny-outy holding pen for the lambs/goat kids. You can never have too many pens!? On the TO-DO list…once the ground thaws, we’ll need to reinforce/re-build the dividing ‘fence-line’ between the rams’ pens which took a pounding this winter. Also, we’d like to construct a shed roof and ANOTHER turn-out area on the south wall of the ‘back’ barn. And NO…just in case you’re wondering…you NEVER run out of chores (aka wish list) on the farm!